King Juan Carlos rejected any suggestion of possible abdication during an interview on Spanish Television tonight marking his 75th birthday tomorrow. The King said, “I am doing well and wish to continue” with the duties of Head of State. Asked about his legacy, His Majesty said,” I don’t like to talk about myself.” But expressed pride in having helped unite “all Spaniards” and accomplished his duty to restore Democracy and the Crown. 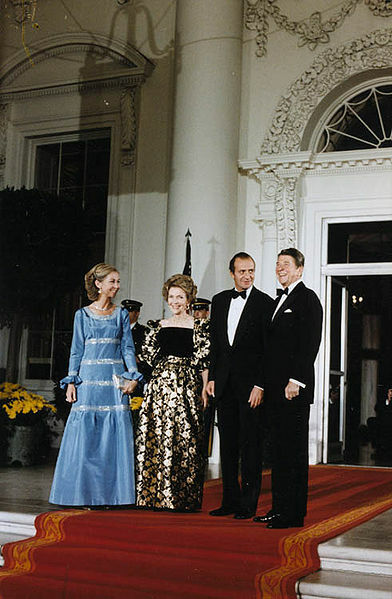 King Juan Carlos and Queen Sofia with U.S. President Ronald Reagan and First Lady Nancy Reagan. Of course, Spain remains divided, especially with regions like Catalonia discussing whether to seek independence. The King reiterated his distaste for the politics of “intransigence” and division. “To me it hurts me a lot,” the King said about people having to leave Spain to find work amid a tough recession. 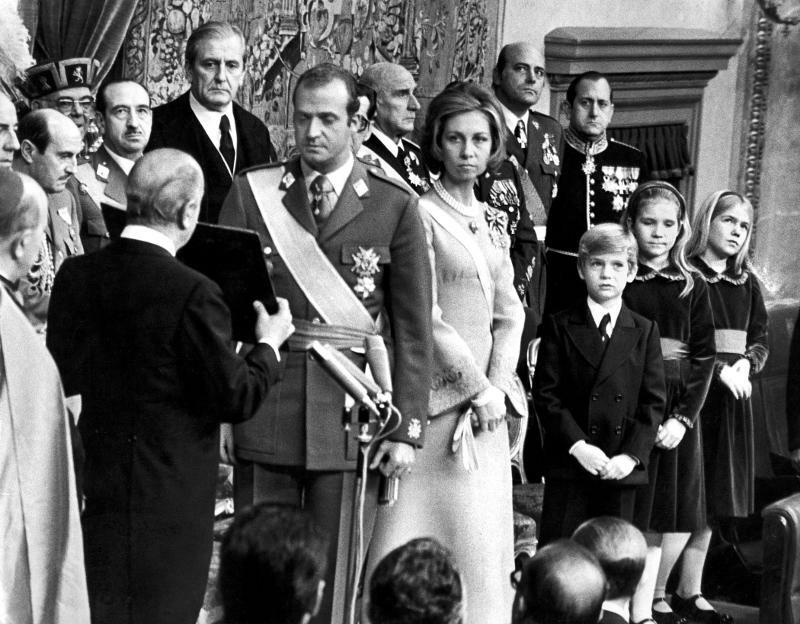 King Juan Carlos’ father, the Count of Barcelona, resigns in 1977 any claims to the throne, allowing his son to follow Gen. Franco as Head of State. The King’s mother Princess María de las Mercedes of Bourbon-Two Sicilies in yellow. 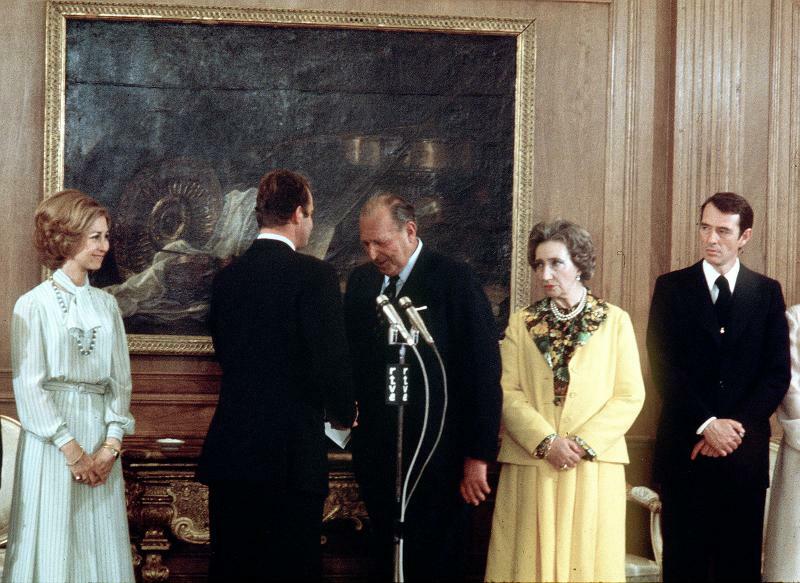 Don Juan Carlos has been King since 1975. “More that satisfied I feel fortunate,” he said. On the day of King’s proclamation. The interview was never expected to generate controversy of bring about tough questions. Still, commentators quickly said it could have been less formal, allowing for the King’s jovial personality to come through. King Juan Carlos called for unity and confidence during his Christmas Eve message, an annual tradition that allows the Monarch to speak at length about ongoing problems. This year’s speech from his office at Zarzuela Palace was notable because it comes amid a secessionist push in Catalonia, ongoing Basque nationalism and a troubled economy. 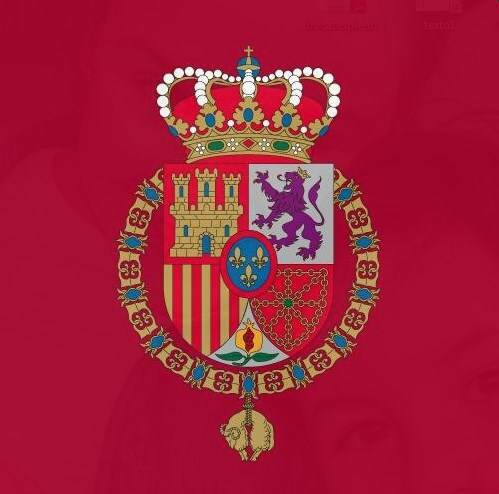 It’s also the first year the King’s Christmas message is broadcast on YouTube and available in the different languages under the Spanish Crown. His Majesty, treading carefully around the secession issue, he called on politicians to seek policies that unite rather than divide. 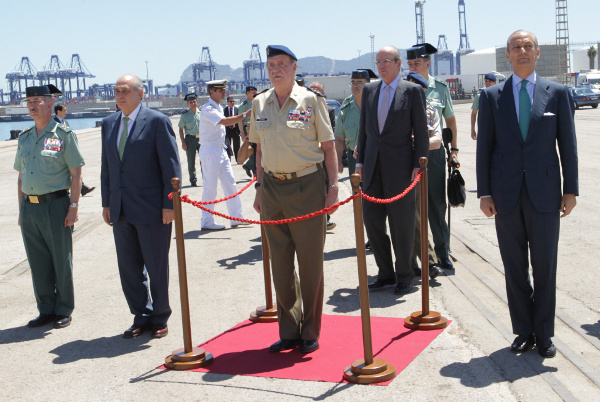 Amid concerns about the viability of the Spanish state as it currently stands, King Juan Carlos called Spain a “great nation” that must be part of global solution to economic and social concerns. 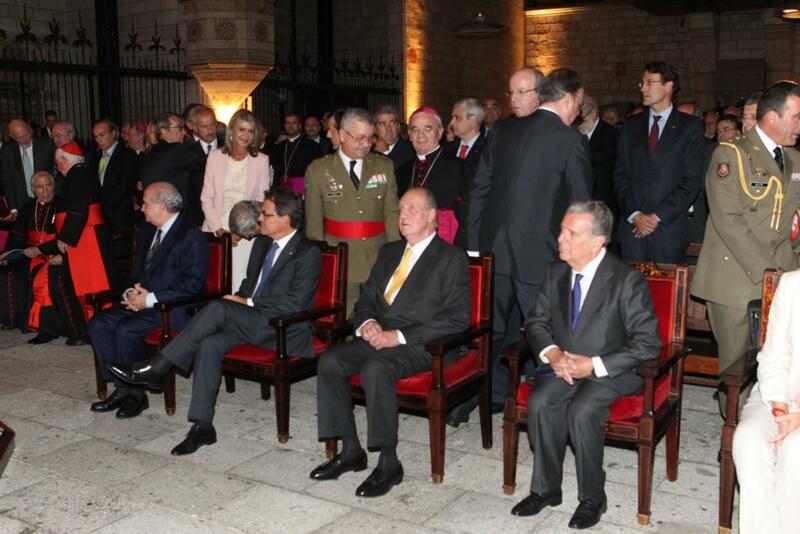 The King recognized the plurality of languages, cultures and traditions that have coexisted within Spain for centuries. Catalonian Republicans and separatists said they wanted more unity, but within Europe and not the Spanish state. Some who support a unified Spain said the King was not forceful enough in discouraging regional nationalism. In a recent open letter addressing Catalonian separatism, King Juan Carlos said it was not the time to pursue chimeras. Spain’s King Juan Carlos finished a four-day state visit to India today, where the two countries finalized several bilateral agreements and pledged increased economic cooperation. 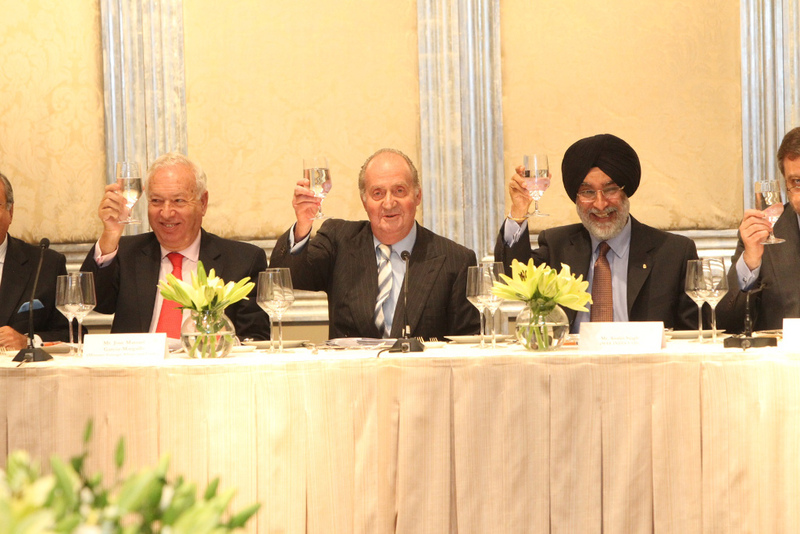 King Juan Carlos meeting with business leaders in Mumbai. 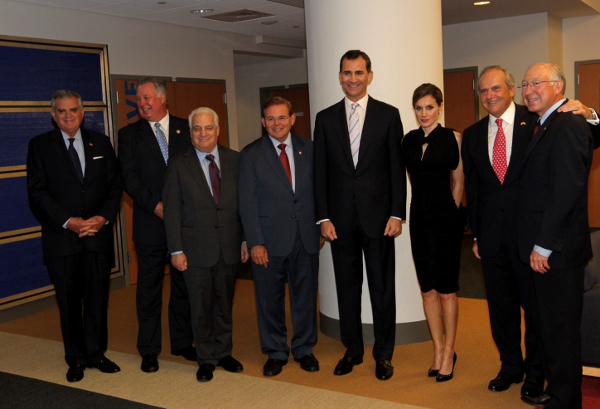 The King met with the Indian leadership, along with local and international business leaders. Bilateral commerce between both countries was worth around $5 billion last year, the Royal Household said. “Today our societies can only progress with a climate of openness, stability and security,” the King said during one of his stops. 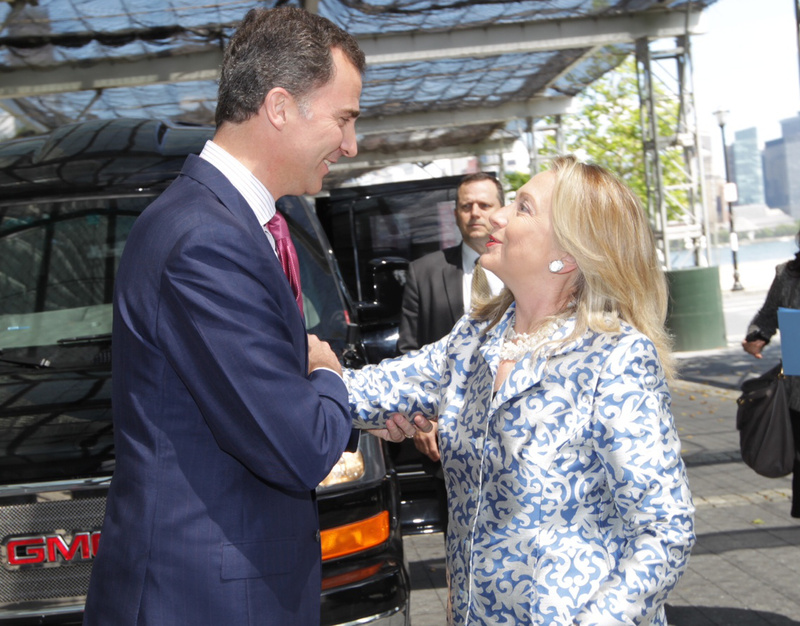 The King has made global trade a priority as a means of improving Spain’s ailing economy. 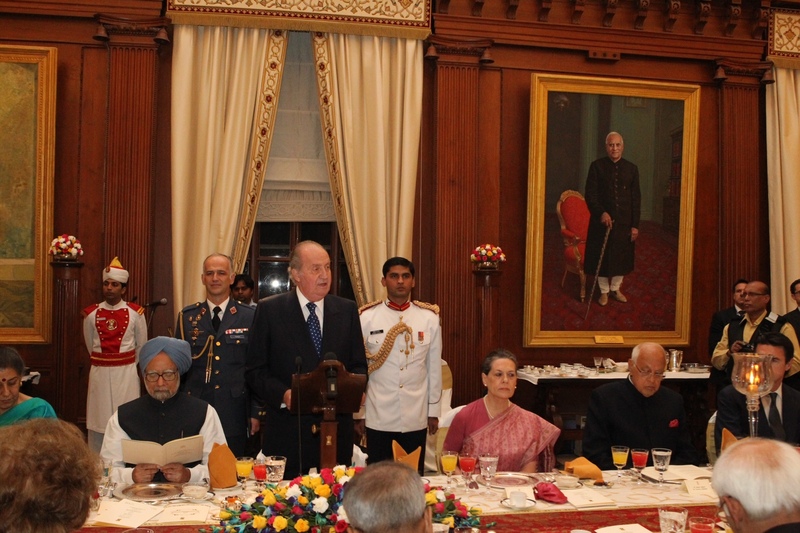 State Dinner in New Delhi. 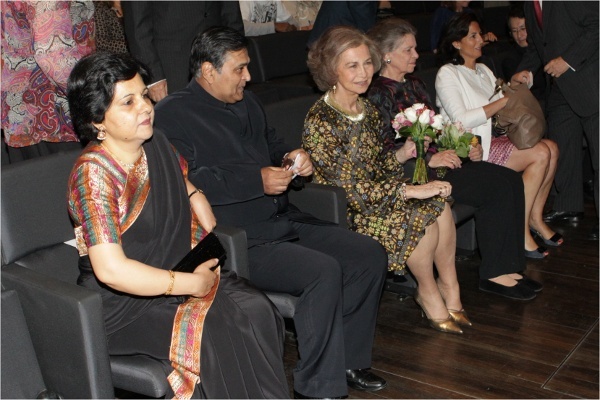 The King secured Indian support for Spain gaining a seat in the United Nations Security Council. 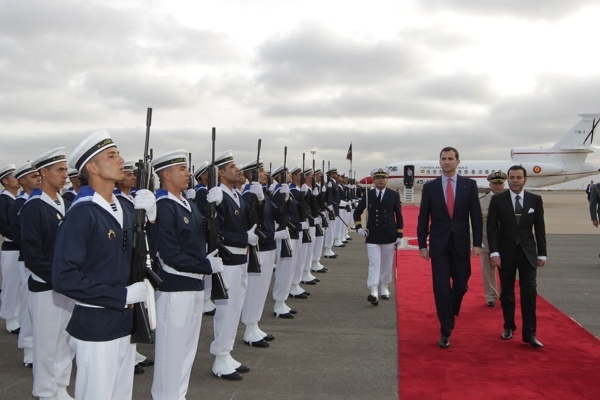 Other agreements include investment in a Catalonian firm and more joint defense activities. 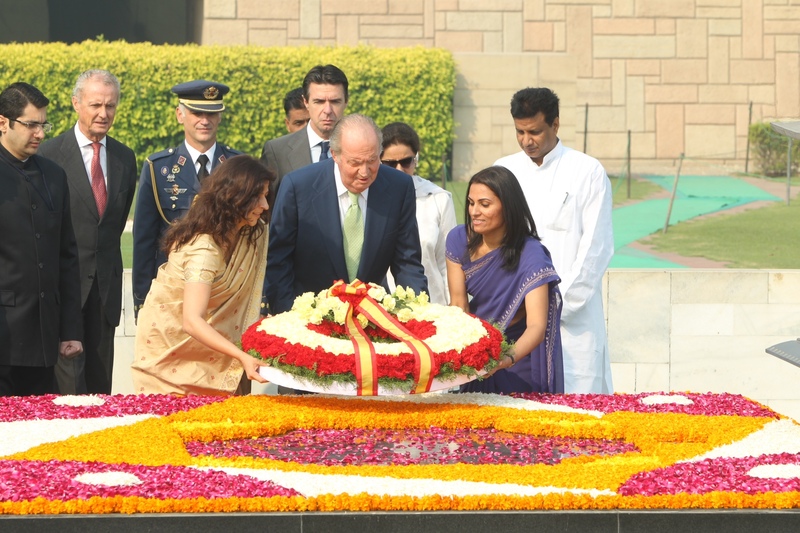 King Juan Carlos offers flowers for Mahatma Gandhi. 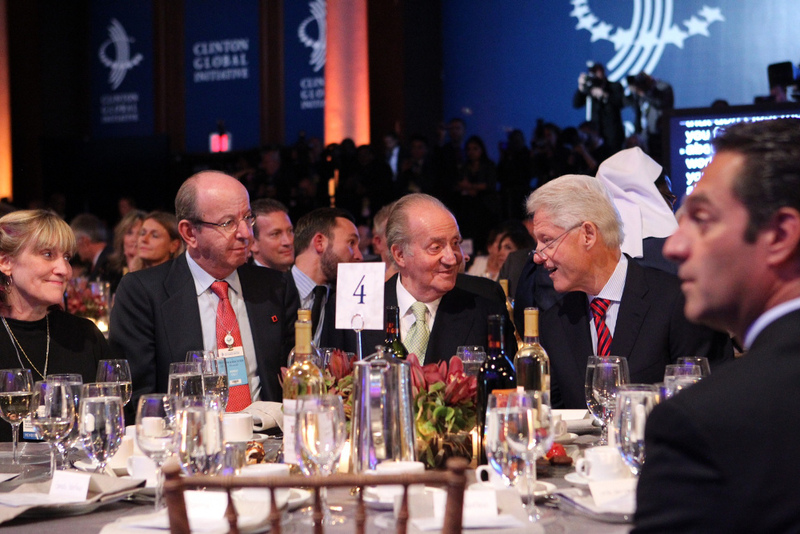 Media outlets reported that King Juan Carlos said the situation inside Spain makes him want to cry, but he also encouraged people not to be pessimistic about the country’s future. 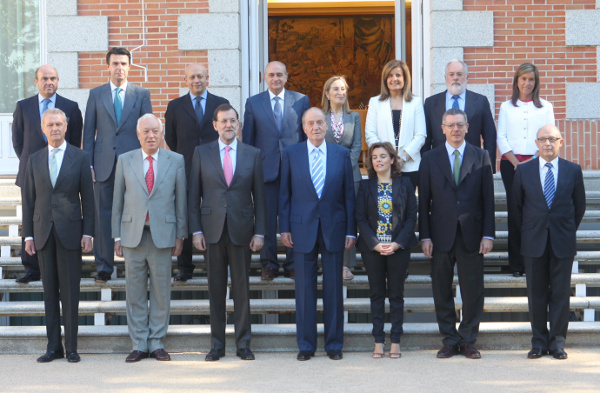 King Juan Carlos called upon government ministers, including Prime Minister Mariano Rajoy, to inform him about the economic situation and crisis measures. 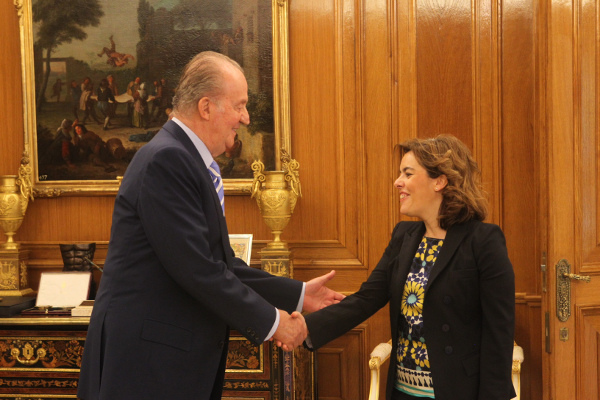 King Juan Carlos greets government Vice President Soraya Sáenz de Santamaría. The King has convened the Council of Ministers a dozen times since the 1978 constitution, the Royal Household said.